Liquid is Mother Nature’s gift to our ever-decaying bodies. Over 70% of the planet is water, and over 55% of our bodies are composed of water. We love H20! At least, we did. Sadly, our complicated man made existence has brought forth the invention, mutation and remixing of nature’s purest beverage. Different drinks for different peeps. A variety of sips for complex needs. Some wake up to a caffeinated cup of coffee. Others fight the urge to sleep off a term paper with a trilogy of Red Bull. While others go “bottoms up” to stir up the nerve to flirt with the girl in the ocean blue glasses. And I can’t help but giggle at the image of a herd of senior citizens drowning in prune juice. We love drinking! Each one of us has an army of liquids to help us to endure this thing called life. But what should a writer drink? Immediately, Jack, Johnny, and Jameson come to mind. One can’t hide from the stereotype of a writer drunk with ink and alcohol. For me, a specific image flourishes. Ted Cole, played flawlessly by Jeff Bridges in 2004’s “The Door in the Floor,” stares at the surrounding nothingness of his lamp lit bedroom. His right hand jangles the ice cubes in a lake of malt. The moist glass pounds on the wooden desk and his fingers dance on the alphabet. Under the shell of night, his mind releases its creativity on the typewriter. Throughout the duration of this creative ordeal, his favorite drink is by his side. I used to believe the notion that alcohol aided the writer. After knowing every bartender in town, and emptying my Tylenol bottle on countless mornings, I’m certainly a poster child for the stuff. But with nothing published, let alone a manuscript sent forth, the results are sobering. Sure alcohol frees our inhibitions, and a writer needs to live fully in order to have something to write about. Though, if he/she is never calm enough to re-enter his/her shell, when will they write? My search for the opportune writer’s drink continued. What about coffee? Well, personally as an idealistic youngster I swore to never take a sip of those caffeinated beans until the age of 35. I obey my inner child, and have yet to rock a cup. Even if I did I’m certain the results will mirror that of its younger sibling. Red Bull, Monster, Rockstar are merely sugar filled soda on crack. This new breed of beverage is all the rage, with more brands than farm animals in picture books. The ensuing hyperactivity may keep me productive, but a writer needs to focus on writing. After a triple-sized Monster, I’m only 264 words in and then next thing I know I’m tweeting about my inexperience as a bird watcher, writing “Happy Anniversary of Your Birth” on Facebook walls, and my tongue bears the burden of removing the muddy cheese powder from my fingers. When I wake up the next morning, sure there’s no need to reach for the Tylenol but those 264 words are all alone. Maybe I don’t need a drink? Nonsense. Everyone has a liquid sidekick, and if I’m ever going to establish myself as a writer, I need to exclusively quench my thirst. “A cup of tea?” Too boring, and I’m scared of sprouting a gardening hat to join Gladys and Edna in their “Who has the best lawn” discussion. “How about Prune Juice?” Not funny, my bowels are nowhere close to checking into the retirement home. “Iced tea? Lemonade?” Intriguing, but a tad lame. “Hot chocolate?” What if I’m writing on a beach? Plus, the warmed milk inside sends me off on a 5-hour nappy-poo. “Apple juice? Orange juice? A juice box?” Juice is just too innocent, and acidic. The truth is there’s simply too much going on in any said beverage to aid me as I pound away on the keyboard. I need something that will ultimately keep me writing. Distractions are the enemy. It’s like I need a chilling glass of nothingness! “That’s it!” Mother nature was right all along. It’s water, iced water to be exact. After awakening my body with a mid-summer’s run, my mind was still jogging with ideas. Immediately I attacked the keyboard. But wait, I’m thirsty. Hmm…what do I choose? Well, I throw a party of ice cubes in a tall glass and let the faucet do the rest. I return to work. The liquid quenches the thirst, and the ice dulls my senses. Sure water may be a tad on the mundane side, but it isn’t distracting. If the liquid your drinking is more interesting than what you’re writing, one of them needs to go. 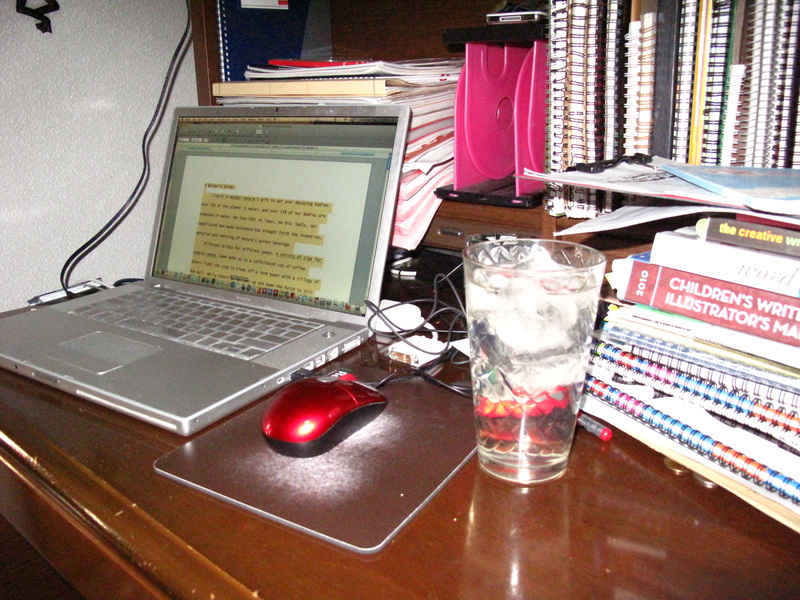 So 99% of the time (when I’m a good little boy), iced water is my writing sidekick. A trusted companion aiding me down the pages of a Word document. And just like Ted Cole in “Door in the Floor,” the jittering cube filled glass lands on the desk, but most importantly my fingers continue to land on the keys. Drinking and driving may be a big no-no, but drinking and writing is a win-win if you find your match. Happy writing/drinking everyone!